Product prices and availability are accurate as of 2019-04-23 17:01:46 UTC and are subject to change. Any price and availability information displayed on http://www.amazon.com/ at the time of purchase will apply to the purchase of this product. 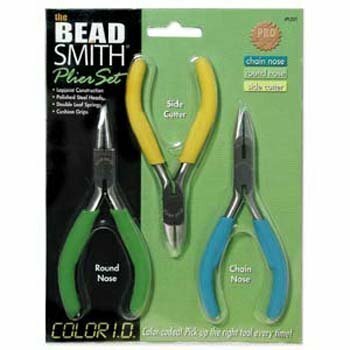 This 3 Piece Jewelers Pliers Pack contains: Like chain nose pliers, the jaw width is largest near the pivot and tapers to a point at the tip, but the differ in that both jaws are circular. These essential pliers have a variety of uses, such as: creating hoops, eye pins, clasps and jump rings, coils and curved bends. 5.5 inches. The jaws of chain nose pliers are both semi circular and meet along the flat edge. The width is largest near the pivot and tapers to a point at the tip. They are typically used to create angled bends in wire, close bead tips, open and close jump rings and form loops. 5.5 inches. These feature jaws that are angled and pointed so that they are nearly parallel to the handles, which makes the cut to the side of the cutter. These standard wire cutters are suitable for Tiger tail, headpins, eye pins and soft wire. They are NOT suitable for cutting memory wire, flex wire or steel wire. 5.5 inches.